We are manufacturing and exporting a wide range of Heat Sinks that are fabricated with high quality raw material to ensure optimum efficiency and performance level. Our heat sinks are available in various sizes and can also be customized as per the specifications given by our clients. 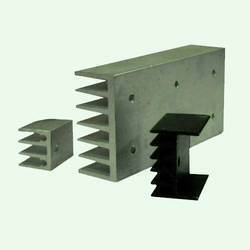 We are engaged in manufacturing and supplying of Aluminium Sheet Heat Sink. This is made of aluminum sheets and used in fixing Transistors and other instruments. Our range of Heat sink is available with or without anodizing to meet the diverse needs of the clients. These products are designed for optimum performance and longer service life. 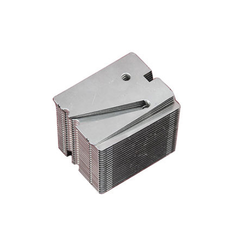 We are one of the renowned manufacturers and suppliers of Extruded Heat Sinks. Our diverse range includes Heat Sinks, Extruded Heat Sinks, Motor Stators, Stamping Heat Sinks, BGA & CPU Heat Sinks. Aluminum heat sink do not require electro copper plating and use extended surfaces to increase the area in contact with the cooling fluid. Our complete range finds extensive applications in various fields like transistors, diodes, silicon rectifies.